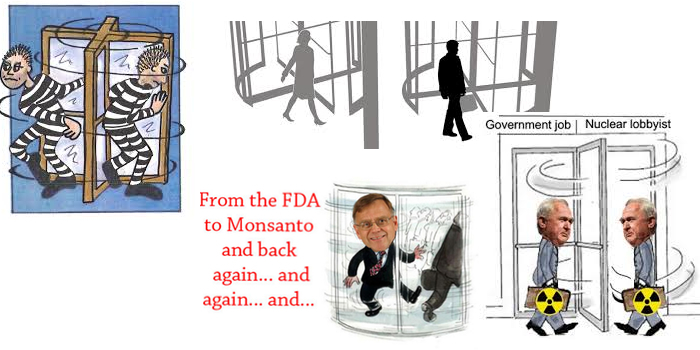 The revolving door refers to the phenomenon in which employees of private companies become government bureaucrats or government bureaucrats become employees of private companies. This is a gross conflict of interest as employees of private companies are appointed to positions to oversee the industry they used to work in. Conversely, government bureaucrats pass policies and laws that are favourable to a particular company or industry and later quit their government posts to work for the same company or industry. This is a form of delayed bribery in which private companies are saying, "Pass regulations and laws that are favourable to our company and when you quit your government post, we'll offer you a well-paying position." individuals is heavily indebted to the Center for Responsive Politics website. Mitchell Daniels Jr. Director, Office of Management and Budget Eli Lilly . Raymond V. Gilmartin Bush Transition Team for the Department of Health and Human Services Merck . Anne Marie Lynch Bush Transition Team for the Department of Health and Human Services PhRMA . Bill Walters Bush Transition Team for the Department of Health and Human Services PhRMA . Dr. Harvey E. Bale, Jr USTR IFPMA . General Counsel-USTR, Deputy U.S. Trade Representative PhRMA . Susan K. Finston State PhRMA . Thaddeus J. Burns USPTO, U.S. Intellectual Property Attach?-USTR, Geneva Akin, Gump, Strauss, Hauer & Feld, L.L.P . Tauzin Changes Sides, editorial in Newsday, January, 2005. Trade which was charged with ensuring Congressional approval of DR-CAFTA. Source: John Garnaut and Marian Wilkinson. Plum Jobs for US Trade Deal Advisors. Sydney Morning Herald July 2004.
where he oversaw export policies into Latin America. affairs initiatives in the United States and abroad on intellectual property and WTO matters. Executive Director for BIO?s Food and Agriculture section. From 1993 - 1999, Randall Tobias was President, Chairman and CEO of Eli Lilly. (1974-75) and then he became Ford's Secretary of Defense (1975-77). Dr. Michael Friedman was the Acting Commissioner of the FDA from 1997-1998.
rank of Rear Admiral and Assistant Attorney General. Corporation. He is also PhRMA's Chief Medical Officer for Biomedical Preparedness. Mr. Daniels has been named by President Bush to head the Office of Management and Budget. In the past, he has worked as a senior advisor to Senator Richard Lugar and President Reagan. Daniels named to Bush Cabinet-Level Post. Dec. 22, 2000. Department of Healthand Human Services. the establishment of the Court of Appeals for the Federal Circuit. Mr.
(PMA- now PhRMA) in 1985, as president. Dr. Harvey E. Bale, Jr.
Representative (USTR) for twelve years. of America (PhRMA); he joined PhRMA in 1989. Clayton Yeutter. From 1987 to 1989 Mr. Holmer served as the Deputy U.S.
Affairs from 1981 to 1983.
expressing PhRMA's displeasure with the WHO's draft resolution on HIV/AIDS. & Austin; he joined Sidley & Austin in 1989.
in Chicago, Washington DC, Tel Aviv, Manila and London,. Intellectual Property and Middle-East/Afican Affairs at PhRMA. Representative to the United Nations from 1993 to 1996. In addition, Mr.
Union and the U.N. High Commission for Refugees. From 1978 to 1979, Mr. Senator Hubert H. Humphrey from 1971 to 1976 Earlier in his career, Mr.
Akin, Gump, Strauss, Hauer & Feld, L.L.P (Washington, D.C. office). Gump, Strauss, Hauer & Feld, L.L.P Attorney Profile. From 1993 to 1996, he was a Commissioner of the Martin Luther King Jr.
Revenue Service Exempt Organizations Advisory Group. of Akin, Gump, Strauss, Hauer & Feld, L.L.P. (Washington, D.C. office). at the Food and Drug Administration (FDA) from 1974 to 1978. Gump's clients include American Home Products, Pfizer, PhRMA, and Warner-Lambert. In 1998, Mr. Allera was an official lobbyist for Johnson & Johnson. for Ronald Reagan's presidential campaign from 1979 to 1980. Warner-Lambert. In 1998, Mr. Donatelli was a registered lobbyist for PhRMA. the U.S. Department of Justice from 1970 to 1971. Mr. Burns was an Associate Solicitor at USPTO. include American Home Products, Pfizer, PhRMA, and Warner-Lambert. Mr.
at at the law firm of Jones, Day, Reavis & Washington, D.C.
Gump, Strauss, Hauer & Feld, L.L.P Attorney Profile). Harshbarger (June 1992 to June 1994). In 1998, Ms. Hyman was a registered lobbyist for American Home Products. Senate Majority Leader (1981-1985), and Chief of Staff to the President (February 1987 to July 1988). Caldwell. Baker Donelson's clients include PhRMA and Schering Plough. In 1998, Mr. Baker was a registered lobbyist for Schering-Plough. Appropriations for Senator Mark O. Hatfield (R-Oregon). Caldwell (Washington, D.C. office). In 1998, Mr. Kennedy was a registered lobbyist for PhRMA and Schering Plough. Caldwell (Washington, D.C. office). In 1998, Mr. Montgomery was a registered lobbyist for Schering Plough. Caldwell (Washington, D.C. office). In 1998, Mr. Tuck was a registered lobbyist for Schering Plough. Mr. Peter Barton Hutt served as Chief Counsel to the FDA from 1971 to 1975. Mr. Hutt was a registered lobbyist for PhRMA and the Nonprescription Drug Manufacturers Association . Justice from 1984 to 1986..
Mr. Kuhlick was a registered lobbyist for Merck, PhRMA and the Nonprescription Drug Manufacturers Association . tenure at USTR, Ms. Archibald served on the staff of the House of Representative's Ways and Means Commitee. Ms. Archibald was a registered lobbyist for PhRMA. Mr. Lawton was a registered lobbyist for Amgen & Genentech. Mr. Lawton was a registered lobbyist for Genentech. the Bureau of Consumer Protection at the Federal Trade Commission. Senator Orrin G. Hatch (R-Utah) for seven years. Vance Hartke (D-Indiana) and Dennis DeConcini (D-Arizona) for ten years. Former Senator Dennis DeConcini (D-Arizona) served in the U.S. Senate for ten years. Interneuron Pharmaceuticals, Metagenics, Monsanto, Pfizer, Pharmacia & Upjohn, Schering-Plough, and SmithKline Beecham. Parry, Romani, and DeConcini, Inc.- a Washington, D.C. based lobbying firm. In 1998, Mr.
Pfizer, PhRMA, Pharmacia & Upjohn, Schering-Plough, and SmithKline Beecham. Mr. Jack W. Martin served as Associate Commissioner for Public Affairs at the FDA. Commissioner for Policy under Commissioners Frank Young and David Kessler. Parry, Romani, and DeConcini, Inc.- a Washington, D.C. based lobbying firm. in the Reagan White House. Ms. Butler is currently a Principal at Podesta.com, a Washington, D.C. based lobbying firm. In 1998, Ms. Butler was a registered lobbyist for Genentech and Genzyme. Senator Ernest Hollings and Senator Jay Rockefeller and Counsel to the U.S.
House Subcommittee on Space for the late Rep. George Brown and Rep.
Ms. Inadomi is currently a Principal at Podesta.com, a Washington, D.C. based lobbying firm. In 1998, Ms. Inadomi was a registered lobbyist for Genentech and PhRMA. Ms. James is currently President of Podesta.com, a Washington, D.C. based lobbying firm. In 1998, Ms. James was a registered lobbyist for Genentech and PhRMA. Mr. Podesta is currently Chairman of of Podesta.com, a Washington, D.C. based lobbying firm. In 1998, Mr. Podesta was a registered lobbyist for Genentech, Genzyme and PhRMA. property issues. Powell Golstein's clients include Genentech and PhRMA. more detail on Brazilian industrial property law see: http://www.cptech.org/ip/health/c/brazil/). on the position the U.S. Government should take on Decree 3,201.
including a two-year assignment with USTR in Geneva, Switzerland (1995-1997). Antitrust, Monopolies, and Business Rights. Mr. Direnfeld is currently a partner in the law firm of Swidler Berlin Sherrif Friedman. In 1998, Mr. Direnfeld was a registered lobbyist for Transkaryotic Therapies. Mr. Hyman is currently of Counsel at the law firm of Swidler Berlin Sherrif Friedman. for Schering-Plough and SmithKline Beecham. as Assistant Counsel-White House (1981-82). Mr. Goldfield is currently a partner at the law firm of Swidler Berlin Sherrif Friedman. In 1998, Mr. Goldfield was a registered lobbyist for SmithKline Beecham and Transkaryotic Therapies. Policy to the Assistant Secretary of Commerce for Trade Administration (1983-1987). Mr. Popkin is currently a partner at the law firm of Swidler Berlin Sherrif Friedman. In 1998, Mr. Popkin was a registered lobbyist for SmithKline Beecham. Mr. Slaiman was Counsel to the Senate Judiciary Subcommittee on Antitrust. Mr. Slaiman is currently a partner at the law firm of Swidler Berlin Sherrif Friedman.